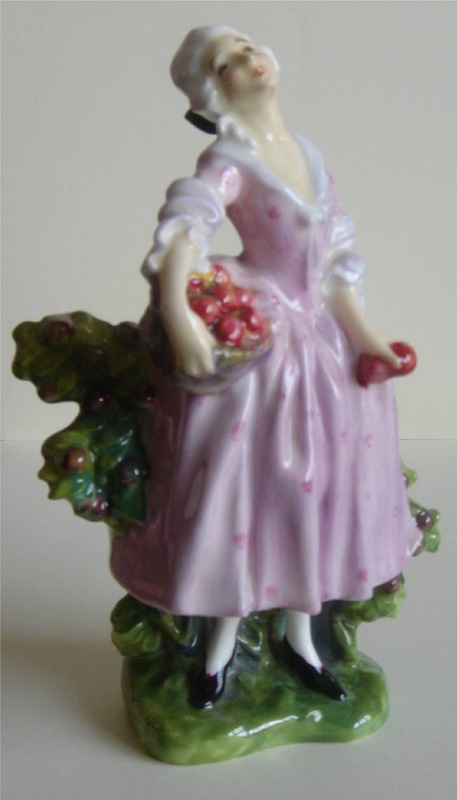 The sheer variety of early figures in Royal Doulton’s HN collection illustrates the lengths that were gone to, to appeal to early collectors as the company tried to discover a popular house style. Title page of an early figure catalogue. Of course by the time the Masquerade pair appeared in 1924, the great Leslie Harradine had already been supplying models to the Burslem art studios for a few years. A burnished gold HN636 Masquerade. 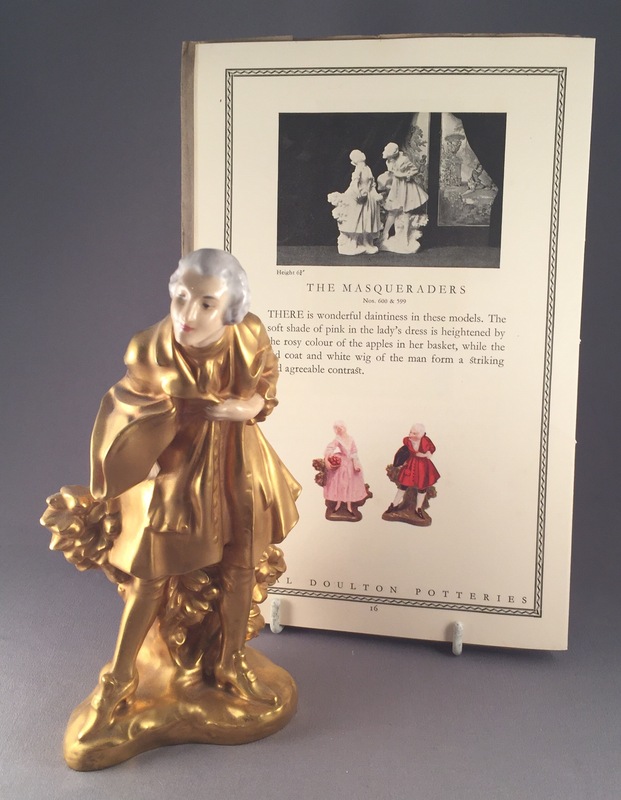 During the early 20thC there was huge interest in masked and costume balls and the latter must have inspired this pairing and other Chelsea inspired figures from a bygone age in English china manufacturing. ‘Kissing’ Masqueraders HN 600 in china and HN 683 in earthenware. 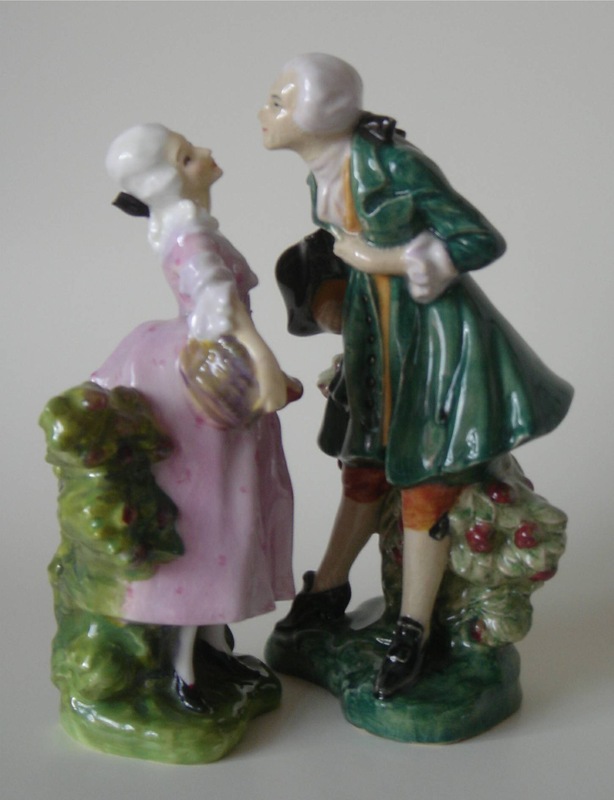 Interestingly the two Doulton models’ bases fit so that the couple can kiss if the owner so wishes. 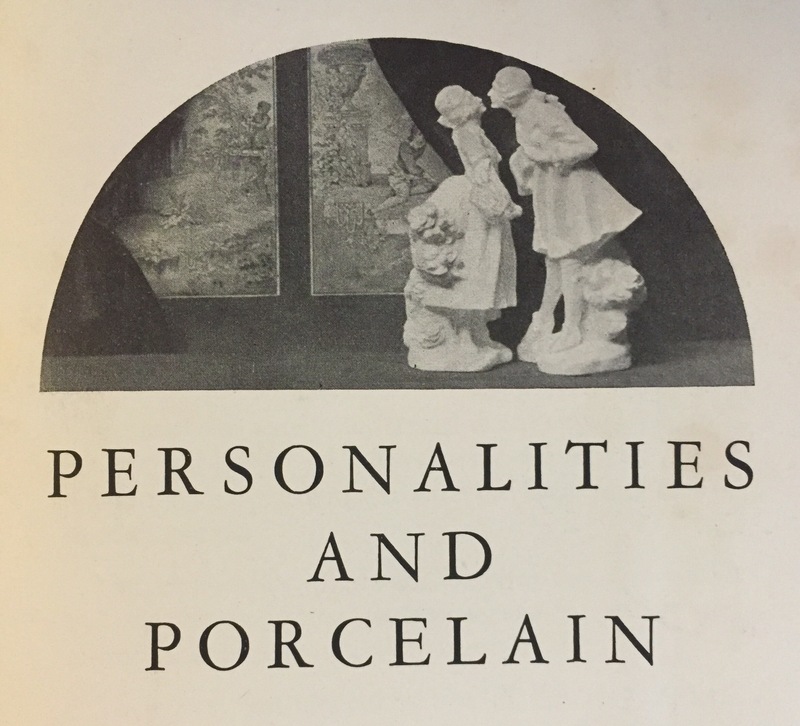 They appear in this 1920’s figure catalogue titled Personalities and Porcelain along with a group of other early figures. Also of interest to note is that HN683 and HN 637 the last versions of each were actually made in earthenware rather than china like the other versions. Masquerade HN 599 & 636. 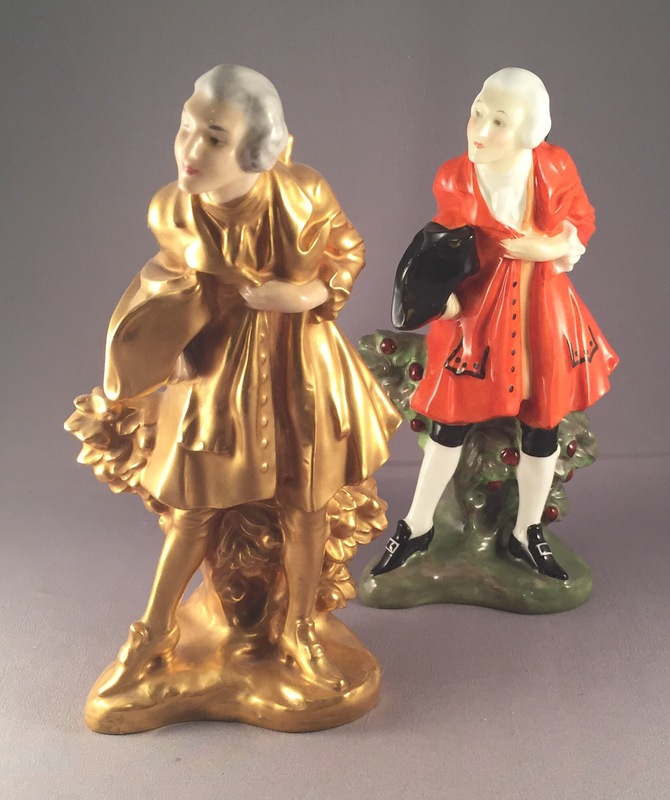 Typical of Doulton’s studios they also experimented with this pair and a handful of other figures, producing examples in burnished gold with ivory face and hand details, imitating gold/bronze and Ivory figurative sculptures from the art nouveau era. A chance find of a portrait plaque featuring a well known portrait of Sir Henry Doulton has inspired this piece. 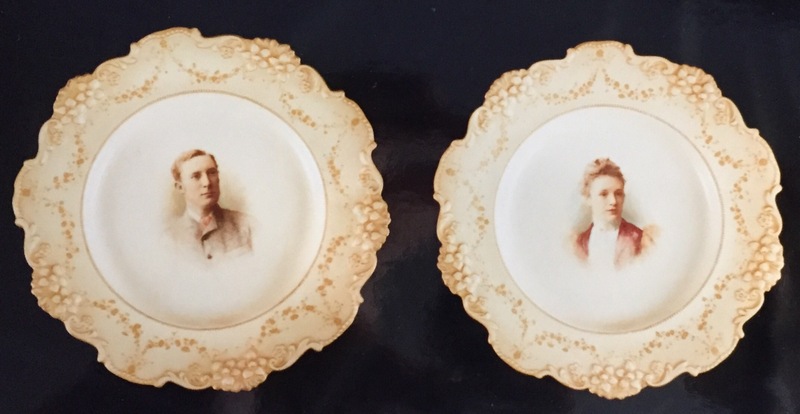 Doulton’s Photographic ware is rare with examples dating between 1893-1905 approximately. 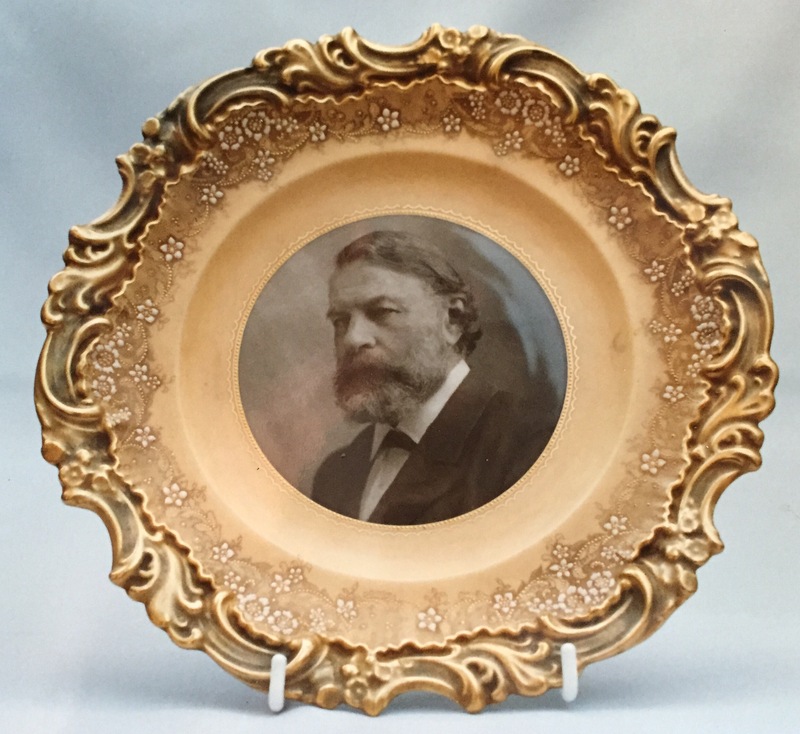 Early plate with a photographic image of Joseph Joachim, a popular violinist. The method of transferring a photographic image on to transfer paper for application on to a china body was developed by John Slater and examples usually carry a simple Doulton mark and also the predictable “Slater’s Patent” stamp. A pair of early Slater’s Patent photographic plates (subjects unknown). Subjects range from famous stage personalities of the time to other period celebrities. Royal Doulton’s famous, former Headquaters in Lambeth. Built in the 1870’s in the gothic style ’A’ and ‘B’ blocks as they were known and the huge chimeney that stood next to them were a London landmark for 75 years and witnessed many of Doulton’s major accomplishments as well as playing host to many famous visitors from Royalty, to politicians, to latter day celebrities. A floodlit view of blocks A and B from 1935 celebrating a Royal jubilee. Doulton vacated these impressive buildings in early 1940 to the newly erected Doulton House, then just a few hundred yards along the Albert Embankment. Lying unoccupied and suffering bomb damage during WWII there was little option left than to demolish these impressive buildings in 1951. A close up of the showroom and main offices block. On the left is the former main office and showroom building, on the right a factory block and chimeney.